When you use the Reposition All Drawings tool, its properties and options appear in the Tool Properties view. NOTE: To learn how to use the reposition All Drawings tool, see About the Repositioning All Drawings Tool. Flip Horizontal Flips the current selection horizontally. Flip Vertical Flips the current selection vertically. Rotate 90 Degrees CW Rotates the current selection 90 degrees clockwise. Rotate 90 Degrees CCW Rotates the current selection 90 degrees counter-clockwise. Use the Offset X and Offset Y operation fields to enter specific values and precisely reposition the selected shape. X: Type a value in this field to reposition your selection along the X-axis. Y: Type a value in this field to reposition your selection along the Y-axis. Up/Down arrows: Use the up and down arrows to modify the value in the X or Y value field. 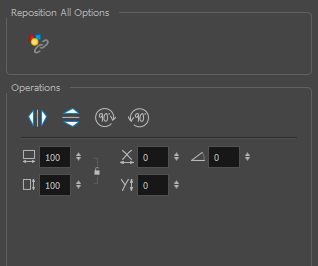 Use the Width and Height operation fields to enter specific values to resize the selected shape with precision. Width: Type a value in this field to resize the width of your selection. Height: Type a value in this field to resize the height of your selection. Up/Down arrows: Use the up and down arrows to modify the value in the Width or Height fields. Lock icon: Click the lock icon to lock or unlock the ratio between the Width and Height values. The Angle operation lets you to enter specific values and accurately rotate the selected shape. Angle: Type a degree value in this field to rotate your selection. Up/Down arrows: Use the up and down arrows to modify the value in the Angle value field.